The property tax in North Carolina is assessed locally, collected by the counties, and is attributed to a property per each $100 of value. How a property is valued depends on many factors, including how the property is used, its value relative to other properties in the taxing region, and the cost of services provided to the property by the local government. Ranging from the lowest tax rate of $0.28 in Jackson and Macon Counties to a high of $0.72 in Cleveland County, the varying cultural and economic landscapes of the Mountain Resources Commission (MRC) region have each county responding to the presence of different challenges and resources. 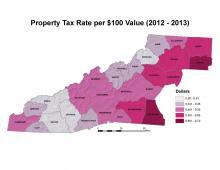 For example, a factor influencing the lower property tax rates of the southwestern portion of the MRC region (including Jackson, Swain, and Macon Counties, among others) and the northern counties along the Tennessee border (such as Watauga, Avery, and Ashe Counties) could be driven by the presence of seasonal vacation homes and their impact on each county’s local economy. Since many of the homeowners do not live in these homes full-time, the requirement for government services to these properties is limited and is thus a likely reason for lower tax rates in those counties. In the MRC counties that have higher property tax rates – such as the eastern counties of Cleveland, Burke, Wilkes, and Alexander – lower average house values could be a factor. As these governments collect less tax per house due to lower home values, a higher tax rate may be needed to cover the local government’s services. Overall, the average property tax rate for the entire MRC region for 2012-2013 decreased 1.6 percent from the average property tax rate in 2008-2009. Note that in North Carolina property must be revalued every eight years, but counties may elect to revalue more frequently. The counties in the MRC region have differently-scheduled revaluation time periods. For more information on median house values, please see Housing Overview. North Carolina Department of Commerce, Access NC. Accessed from: http://accessnc.commerce.state.nc.us/EDIS/page1.html.